In my opinion, the Celosia is one cool looking flower. I like how the curious shape adds interest to a bouquet and how the texture reminds me of a brain specimen with a velvety exterior. The furry surface and deep saturated colours of reds, oranges and yellows, make this flower a fabulous choice for fall themed floral arrangements. I’m not the only one who is reminded of a brain specimen when looking at a celosia. In fact it is often referenced as Brain Celosia. A gentler reference is Wool Flower. However, the most popular name for this flower is Cockscomb because its shape is suggestive of a rooster’s comb. The name Celosia is derived from the Greek word “kelos,” or “burned” because of its bright, fire like colours and the pointed, flame like shape of some varieties of this flower. In the language of flowers, the celosias symbolised humour, warmth, and silliness. It was a challenge to find much information when researching this flower, but besides the usual references which I shared above, I did uncover one interesting fact: the celosia is a food crop in some areas of the world. The blooming time is from late summer to early fall at which time the celosia is cultivated in West Africa, Central Africa, and Southeast Asia as a leaf vegetable and cereal crop. In southern Nigeria, it is the most important leaf vegetable and is known as soko. Optional: 3 – 4 Cordeline leaves rolled around your finger and stapled. Soak floral foam and fit into container with approximately 1” of the foam showing above the edge of the container. Round off the edges of the foam and cut a well on one edge so there is a place to top up the water supply. Secure foam into container with floral tape. This arrangement is 2x the height of the container on the left side and at container height on the right side. The anchor point – the invisible point to where all stems direct themselves – is the center of the container, so remember this as you insert each flower. It doesn’t matter which end you start on, but try to create a smooth gradation from tall to short (or short to tall) with the roses and celosia. I started with a larger celosia and fit roses around it to begin the design. Fill in gaps with pittosporum and ivy. Tuck rolled cordeline leaves into both ends of the arrangement. Note: I broke my promise a little with this floral design because it is a somewhat tricky to create, so take your time and be confident that your final piece will look gorgeous no matter what. 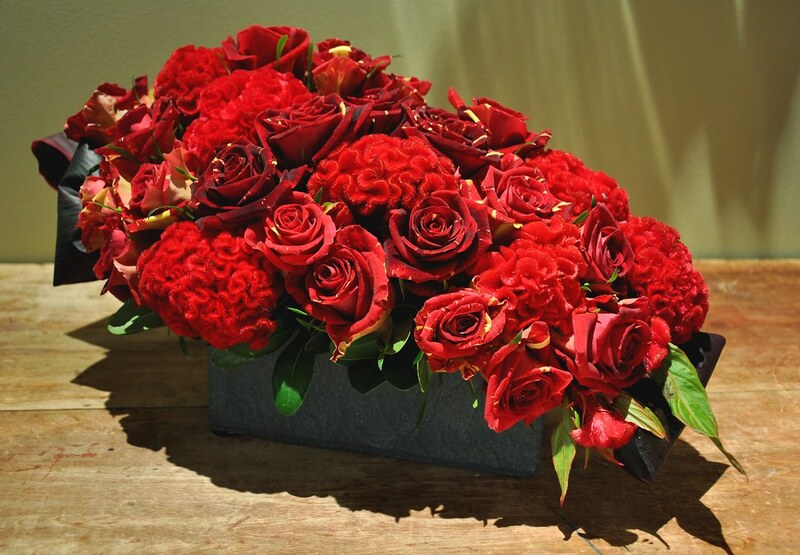 This entry was posted in Floral Arrangement, October and tagged Celosia, celosias, Floral Arrangement, floral design, floral shop, floral shops, language of flowers, pittosporum, Roses, southeast asia, spray roses. Bookmark the permalink. Both comments and trackbacks are currently closed.